This week at Mobile World Congress, Syniverse has been continuing its effort to help alleviate the inconsistent experience that many mobile users can face when they attempt to use public Wi-Fi. For the second year in a row, we’ve joined forces with other mobile industry leaders at the Fira Gran Via venue in Barcelona to make the public Wi-Fi more available and easily accessible through the deployment of an advanced network, Next Generation Hotspot. 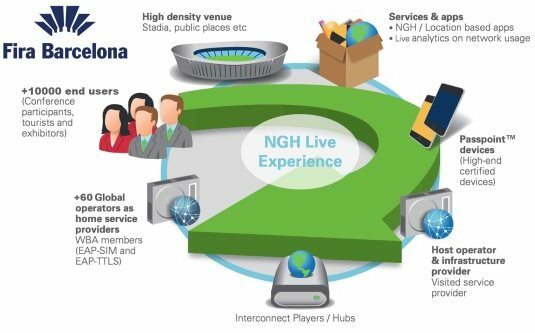 The network is part of a Mobile World Congress program titled Next Generation Hotspot Live Experience that is being hosted by the Wireless Broadband Alliance and GSMA. The benefit is that attendees can instantly roam on to the Mobile World Congress public Wi-Fi network through a simple and mostly automatic process. Specifically, Next Generation Hotspot enables users with Passpoint-enabled iOS and Android from participating operators to connect through a seamless behind-the-scenes process that relies on secure operator-verified credentials. For our part, we at Syniverse are serving as one of the main hub providers and helping automatically authenticate mobile devices for this network. Our contribution builds on our membership in the Alliance and a long history of collaborative efforts. These have included joining forces on programs such as the Wireless Roaming Intermediary Exchange specifications and the Wireless Broadband Alliance-GSMA Wi-Fi Roaming Taskforce, among others. On a broader level, Next Generation Hotspot marks another important step toward improving the experience with public Wi-Fi. Obstacles to this experience can include everything from different authentication methods, to inconsistent security standards, to overloaded capacity. These can add up to frustrated, data-hungry consumers as well as disappointed Wi-Fi operators that don’t realize the volume of traffic they expect. The improvement in the usability and the quality of Next Generation Hotspot is something we hope will ultimately lead to happier users. And what better stage to demonstrate this technology than at the mobile industry’s biggest trade show of the year. As mobile devices increasingly become the channel though which people manage their everyday lives, data connectivity has become a must at any moment or location. Syniverse is privileged to be able to contribute to making this connectivity easier and more available. What do you think about public Wi-Fi? What kind of places do you think need more seamless Wi-Fi access? I would love to get your comments. As Senior Product Management Director, Dan Klaeren is responsible for Syniverse’s Wi-Fi, IoT and mobile virtual network enabler (MVNE) services. In this role, he uncovers new opportunities and devises new business and technology solutions for Wi-Fi operators, cable operators, mobile operators, and enterprises. Dan brings over 20 years in developing and managing information technology solutions, which have included senior roles at PricewaterhouseCoopers, Fidelity Information Services and Prudential. Prior to joining Syniverse, in 2012, he led several small businesses that specialized in delivering custom mobile applications, mobile content delivery systems and mobile messaging applications. Dan holds a Bachelor of Science degree in information technology and advanced mobile development certifications from the University of Phoenix, and he is a frequent contributor to the development of Wi-Fi standards for industry groups such as the Wireless Broadband Alliance.